Bad breath comes down to one culprit—bacteria. There are over 600 types of bacteria found in the average mouth and the majority of them gather on the back of your tongue and produce what's known as volatile sulphur compounds (VSCs). This is also the part of the mouth that isn't effectively rinsed with saliva, a natural mouthwash. 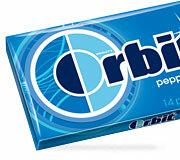 All you need for fresh breath is good oral hygiene and simple habits. Here's how to head off halitosis all day. Start the day with a clean mouth. Brush teeth, making sure to get right up to the gums and finish with a rigorous brushing of the tongue. Rinse with an alcohol-free antibacterial mouthwash like CloSYS ($9)—a patented pepperminty chlorine dioxide rinse that kills the bacteria that cause VSCs. Clean your mouth after lunch (especially if you've consumed meat, garlic or dairy). Don't want to take a toothbrush to the bathroom? Sugarless gum can alleviate plaque and activate enough saliva to rinse your mouth. A glass of water before a meeting will ensure your breath isn't offensive. Studies have also found that black tea fights the sulfuric compounds that cause odors. If you're in need of a minty mouth after dinner, an antibacterial spray like the pocket-size Breath Rx ($10) ensures fresh breath with a quick spritz. Before bed, floss to remove plaque and leftover food debris. Brush your teeth and tongue and finish with mouthwash again. And since a dry mouth is a dirty mouth, Dr. Richard Price, of the American Dental Association, recommends sleeping with a humidifier during the winter months. While the most obvious reason for bad breath is food, other offenders include acid reflux, gum disease and dehydration.